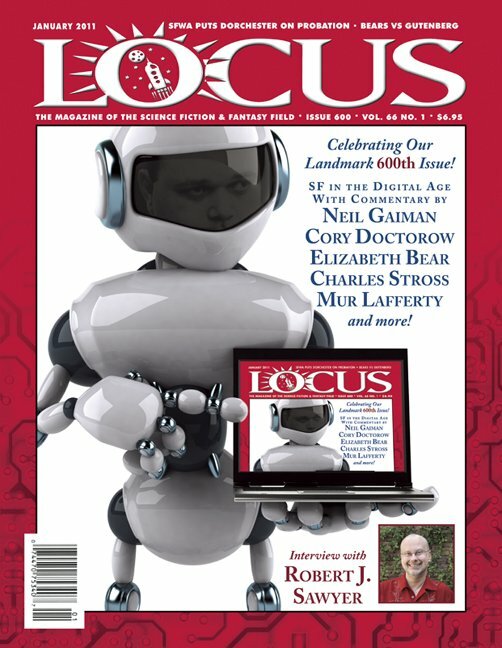 A column by Cory Doctorow, "Net Neutrality for Writers: It's All About the Leverage"
F&SF 11-12/10; Asimov�s 10-11/10; Asimov�s 12/10; Stories, Neil Gaiman & Al Sarrantonio, eds. ; Interzone 231. Asimov�s 1/11; Analog 1-2/11; Apex 11/10; Beneath Ceaseless Skies 10/10; Abyss and Apex 4th Quarter 2010; GUD Summer �10; Pink Noise, Leonid Korogodski; Blind Swimmer, Amonymous, ed. ; Dark Spires, Colin Harvey, ed. ; Jabberwocky 5, Sean Wallace & Erzebet Yellowboy, eds. Among Others, Jo Walton; The Silent Land, Graham Joyce; The Universe of Things, Gwyneth Jones. The Bards of Bone Plain, Patricia A. McKillip; Midnight Riot, Ben Aaronovitch; The Cardinal�s Blades, Pierre Pevel; The Hammer, K.J. Parker. Surface Detail, Iain M. Banks; The Technician, Neal Asher. Steampunk Prime, Mike Ashley, ed. ; Steampunk II: Steampunk Reloaded, Ann & Jeff VanderMeer, eds. ; Yarn, Jon Armstrong; Surface Detail, Iain M. Banks; The Secret History of Fantasy, Peter Beagle, ed. Star Crossed, Elizabeth C. Bunce; The Lost Gate, Orson Scott Card; Pathfinder, Orson Scott Card; The Search for WondLa, Tony DiTerlizzi; The Hole in the Wall, Lisa Rowe Fraustino; Reckless, Cornelia Funke; Blue Fire, Janice Hardy; Monsters of Men, Patrick Ness; The Grimm Legacy, Polly Shulman; Alien Invasion & Other Inconveniences, Brian Yansky. The Fall, Guillermo Del Toro & Chuck Hogan; How to Live Safely in a Science Fictional Universe, Charles Yu; Noise, Darin Bradley; Dead Sea Fruit, Kaaron Warren; The Devil, Ken Bruen.